We now live in such modern times that you can’t help but be obsessed with weight loss. It’s hard to avoid new and interesting notions because you would try anything to lose those extra kilos, no? Every day there is a new super diet or a super food, pills or green drinks that promise to help tackle your weight loss woes. If you want to stay fit and healthy while losing weight, then you need to stop believing these biggest weight loss myths right away. Myth: Skipping meals is the best way to lose weight. Many, many people skip their meals and think that this is the best way to lose weight. This is incorrect beyond your wildest measures. Starving not only makes you weak, but it also increases your cravings for high-calorie food. Myth: Drinking many litres of water helps in weight loss. Sometimes, it’s great to drink water instead of reaching for that bag of salty chips or sweet sugary processed biscuits. Drinking water to fill your stomach so you would eat less will again make you cranky, nutrient-poor, and crave for foods that are high-fat, high sugar. This is not so good for weight loss. Myth: Exercise daily for an hour to lose weight. Everyone has a different body. Some people think doing high-intensity exercises and eating less during the day will help them lose weight. This is not true. Truth is, you need to make up for all the times you are sitting down by moving your body in the day. Different workouts suit different people. Myth: The more hours you do the workout, the more you’ll lose the weight. No! Exercising too much will make you fatter. This is because the more calories you burn, the hungrier it makes you. There is exhaustion leading to hormonal exhaustion and that increases your body’s tendency to store fat. Myth: I go to the gym so I can eat that. When you go to the gym, the exercise and fitness routines help you justify the food you are already eating. If you think you can eat extra or eat “bad food” and then go to the gym, it will not make a difference. In fact, it will take you longer to lose those extra kilos you put on for letting yourself go last weekend. Myth: Only white sugar is the bad sugar. Whether it’s white sugar or brown sugar, all sugars have the same makeup source, that is glucose, fructose, sucrose or a combination. You need a little sugar which you can get from fruits or good food items like sweet yogurt which also has calcium and protein. So make sure you control the servings of pastries and soft drinks to reduce the intake of sugar. Myth: Artificial sweeteners help weight loss. You’ll find these in diet soda drinks, energy drinks, sugar-free chewing gum. Artificial sweeteners are loaded with fake sugars. These are addictive and that’s why you keep consuming these products. Artificial sweeteners disturb your metabolism, your appetite and cause weight gain. Myth: I can pop “pills” or “drink this” to lose weight easily. This is one of the most cynical myths, they are not safe for you at all. We are talking about the unlicensed, unpatented, unprescribed pills in the market. These products have harmful chemicals that are terrible for you. Consult a certified doctor before you indulge in quick-fixes as these. Myth: Low-fat food is great for losing weight and keeping it off. That low-fat food is heaped with sugar! When your body can’t process excess sugar, it stores it back in your body as fat. You need good fat, essential fatty acids, for example from dry fruits like almond, coconut oil, etc. for proper cell growth, glowing skin and even to lose excess weight! Myth: Snacking between the meals is bad for you. For your blood sugar to stay normal, you need food in your body every 3-4 hours. When the blood sugar is normal, you won’t get unwanted sugar or salt cravings. If your body thinks it’s deprived of sugar or salt to stabilize the blood sugar, then it will go into survival mode and make you reach for that cupcake or chips. Myth: Eating certain foods will help me lose weight. Some people believe eating chilies will help you lose weight. Although some calories are burnt while digesting chillies, the calories lost is very insignificant. If you want to improve your metabolism, it’s better for you to workout instead. Myth: It is better to lose weight slowly. Some people assume that if you lose weight quickly, you will gain it back at the same rate too. That’s why most keep away from programs that help you lose quickly. 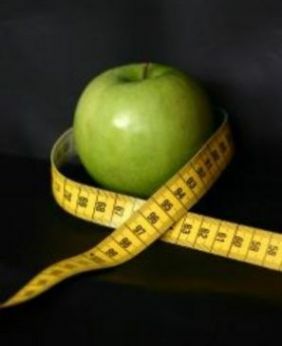 It is not entirely true if you loose that weight through a structured program and a good balance of food and exercise. Research shows that those who lose a lot of weight in a short time, reach their weight loss goals quickly and that motivates them to stay that way. Myth: Don’t eat carbs after lunch. Ideally, eating fewer carbs at night will reduce calorie intake and increase your metabolism which helps you lose weight. Avoiding carbs completely reduces your metabolism which will make it harder for you to lose weight. Weight loss is not about carbs, it’s about how active you are and how many calories you burn each day. If you’re looking to lose weight, you know that your mind is generally open to all kinds of things so as to strike a chord with that one remedy that will work. “Have hot water, lemon and honey in the morning. Okay, I’ll do it.” “Avoid carbs in my diet? Okay, that can be done!” And while you’re in the midst of dreaming about that perfect body, one thing that is most tempting is that awesome diet which has worked for that celebrity from Hollywood. Fad diets promise you a lot of things which sound great for your body. The fact that it is a trend that celebrities follow makes you believe in its effects because the results are right in front of your eyes. But in reality, fad diets can be extremely harmful to your body. The weight loss is very momentary and your body will end up gaining more kilos once you stop following the diet. When you are depriving your body of the regular foods, what you are losing is muscle weight and not the fat on your body. The result? You have a body which makes you thinner and fitter on the outside but is very weak on the inside. The reduction of muscles in your body reduces your strength and lowers your energy levels. Lack of enough nutrients may also cause hair loss. Proteins make your hair stronger and shinier and the lack of it will lead to your hair to become scanty and weak. This is ironical because you have decided to follow the diet primarily to lose weight. While it does help during the days that you are following the diet, but the moment you decide to end the diet and get back to your normal routine, your body starts gaining weight. You may also weigh more than you were before the diet. This happens because you tend to consume more unhealthy food because of the restrictions you put on your body while you were on the diet. Fad diets consist of very specific foods and hence tend to deprive your body of some of the vital proteins, vitamins and minerals it needs for normal functioning. The lack of nutrients affects your body in several ways. Your hair starts falling, skin looks pale, nails become brittle, and you may even start getting dark circles under your eyes. When you have multiple normal meals during the day, your body is used to a particular pattern and acclimatises itself to it. It can adjust if you happen to skip a meal at times or happen to overeat at a particular occasion. But with the diet, your eating pattern suddenly changes and this has adverse effects on your metabolism. Thus, your body may not be able to digest food properly during the diet and the effects may also last after the diet. A lot of diets compel you to survive on liquids that help you get rid of all the water weight in your body. This means that you are not exactly losing the fat in your body. Losing water weight is easy but the moment you start eating solid foods, your body will gain all the weight back. And that’s not all. This causes your body to get severely dehydrated leading to feelings of fatigue, nausea, and dizziness. So what’s the best way to lose weight? You can go on a diet but ensure that it is designed to provide enough nutrition to your body. And exercise! Even a daily walk on half an hour or a quick swim in the pool will help and will give you far better effects than following a fad diet. Can pineapple cure cough and cold? Here’s a recipe for that flu shot. Forget over-the-counter cough syrups. 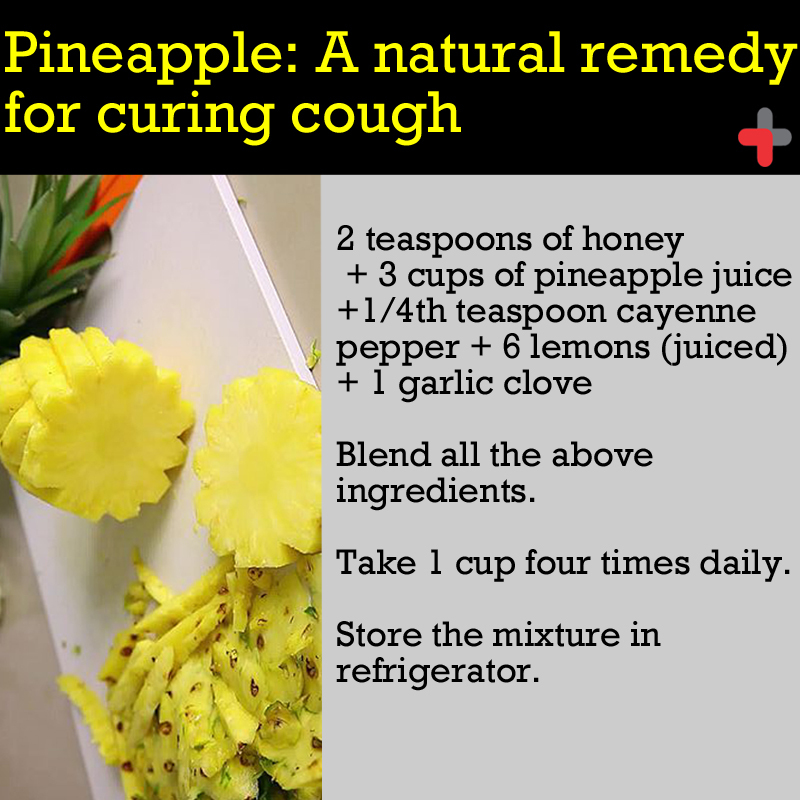 Let pineapple do the trick – it melts mucus! With the heat soaring, cloudy days and the day-night changes in temperature, it is the kind of weather that breeds coughs and colds. If you get a serious case of the sniffles, the logical move is to buy an over-the-counter medicine, like Glycodin for instance, and wait for the annoying storm to pass. Here is a quick treatment for coughs, that came about while researchers were trying to find the positive effects of natural ingredients on those suffering from tuberculosis. It was found that a mixture of raw pineapple juice, cayenne pepper, salt, and raw honey, when taken regularly, dissolved mucus in their lungs. Some later studies proved that raw pineapple extracts cut down mucus five times faster than cough syrups that you can buy over-the-counter. Also, pineapple extracts helped patients recover 4.8 times faster. Besides that, all symptoms related to coughing, especially hacking, reduced considerably. Continue reading Can pineapple cure cough and cold? Here’s a recipe for that flu shot. Posted on April 7, 2014 April 9, 2014 Author avanikaavaCategories Common Health Issues, Healthy Food, Healthy LifestyleTags alternative medicine, benefits, common colds, cough syrup, healthy lifestyles, mucus, natural remedy for colds, pineapple, pineapple juice, super foods, weight loss7 Comments on Can pineapple cure cough and cold? Here’s a recipe for that flu shot. Eight or ten hours in the office and most of us are looking for the most comfortable place to sink in. All the mind work, some of it tedious, does a lot of us in. And many of us use that one drink to feel better (and smokers do even worse), which then turns into another drink. In short, that is office life for you. However, it does not have to be that way. First of all, you can definitely feel much more sprightly with a little smarter use of your body while at the desk. And the other thing is, it keeps you from going fat. Anyone will tell you that they put on those extra pounds because they sat on the desk and worked to make money for a ‘better’ life. Yes, it is ironic. While at your office desk, you can actually exercise without really disrupting your work. And this will mean you don’t have to do that extra half hour at the gym (provided you are the kind that actually goes to the gym post work).